good start...how far along are you? Good eye, PR. I hadn't spotted what the edging around the strawberries looks like. If it is an old wheelbarrow bed, I hope it has drainage holes! Yes its an old wheelbarrow. This is my first year planting strawberries so honestly i don't know if it will work well or not. They have done good so far. I did drill several holes in the bottom for drainage. Considering people use containers for hanging baskets and what not i figured the roots would do ok in there. Its deeper than to looks in the pic as well. Just another experiment, we shall see. Well I planted 9 strawberry plants in one of those "strawberry pots". And my main concern was if it was suitable for them and would the grow stunted. 8 broccoli's growing pretty nicely; watching the little broccolis form is so fun. about 10 red onions, growing steadily, wanting to plant a row of sweet white onions as well. about 10 garlics, also growing nicely, maybe about 2 or 3 inches tall now. I would like to do more peppers, maybe something spicy and ornamental, and also tomatoes in the next several weeks. Any other suggestions for a north texan first timer? We have planted cabbage and broccoli plants,onion sets,radish,lettuce and carrot seeds in the garden. other vegetables and herbs are in the house peeking out the windows. I have 20 garlic plants in a nice sunny spot against my back wall - I really think it's an ideal place for an overwintering crop, as it doesn't get as much sun in the summer due to an overhang on our house. It's my first time growing garlic, so I'm pretty excited that every clove took hold. I'll be planting about ten tomato plants of different varieties, about five or six bell peppers, and a few various hot peppers. And I'll add some basil, cilantro, and cucumbers to the parsley that's holding out nicely from last year. Also, I think (could be wrong) that Brocolli, Cauliflower and radishes as cooler weather crops, and do have some trouble in warmer weather. i don't think if that may be the source of your problem with the CAuliflower? 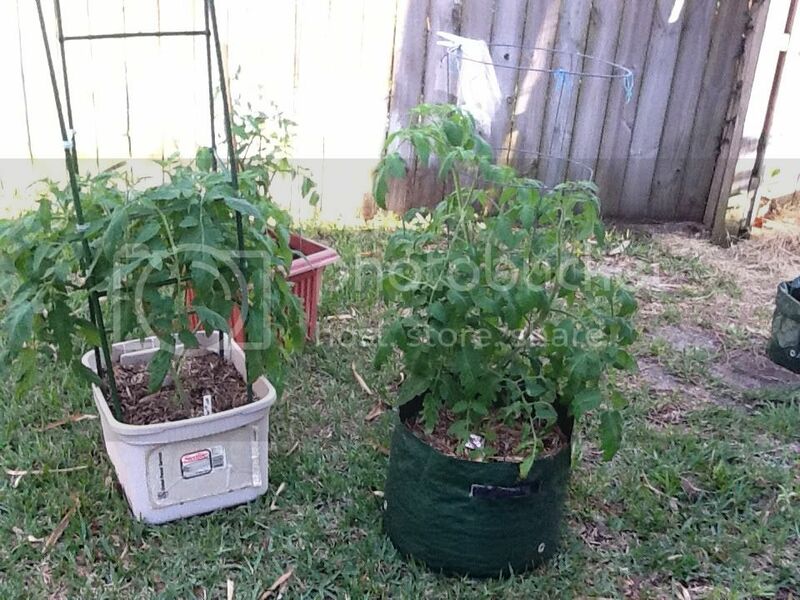 Florida tomatoes right now! Looking good! 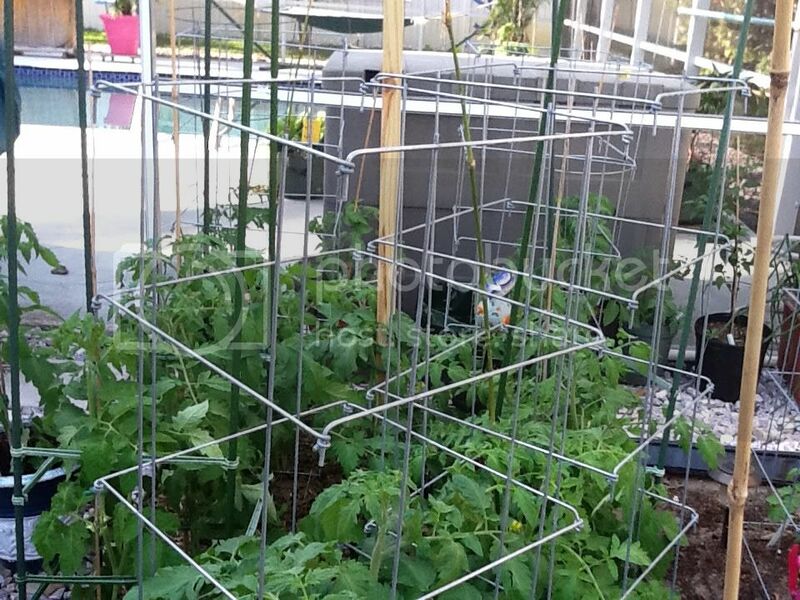 Well it has been a mild winter in Florida, I have about 40 tomato plants going, peas, beans, peppers, onions ( that will be a joke) and lots of chard and lettuce. I am very proud of tomatoes, they all look great so far and are loaded. These pictures were about 3 weeks ago, they are much bigger. Oh you can tell by supports I am trying various methods out this year. This doesn't include my front yard, the HOA is loving me right aout now. have 15 that look better up there, they get sun all day. These get about 7-8 hours, hoping that improves with time change and longer days. I'm just getting started - right now I've got several tomato plants starting to flower and a gorgeous ruby chard which I planted last year. My herbs continue to do well but I haven't seen any growth on the new seeds I planted last week yet. I also have a mystery plant. I thought it was Brussels sprouts but now I'm starting to wonder if it's just a cabbage. I need to go back and check my gardening diary because I don't think I planted "just" cabbage. If it IS a Brussels sprout plant....there are no sprouts yet! 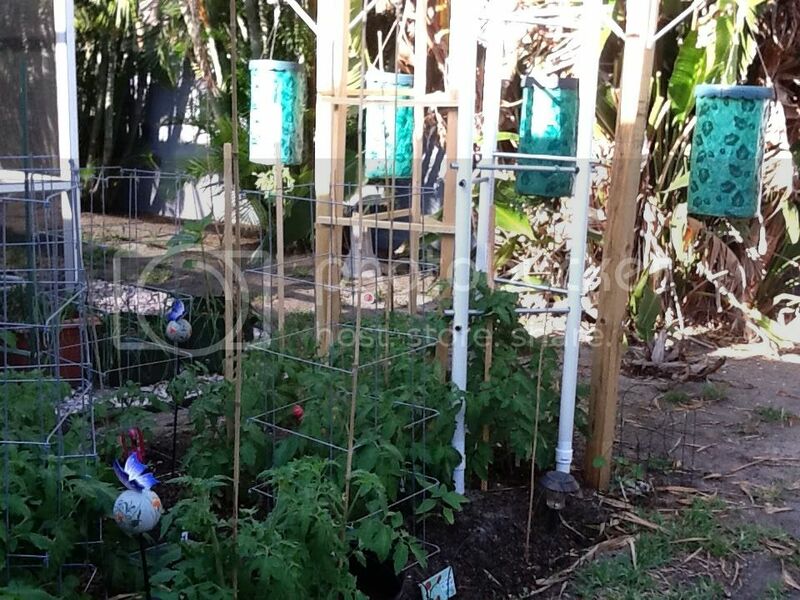 I planted cucumbers, tarragon, zucchini and yellow squash. It's COLD here this weekend, unexpectedly, so I am going to wait one more week before I put in my cantaloupe seeds. Question for the southern growers, with your tomatoes already growing and I read that they usually end about July, Do you replant and get a 2nd crop?? does that work for other vegetables as well, makes us northerners a bit jealous at least me.. or is it alot of work replanting like that.. I'm just getting ready to start my seed indoors.. I'm going to plant a second crop of tomatoes. I planted too late last year - my dogs dug up my March planting, I re-planted in mid-May which is already often 100 degrees here. 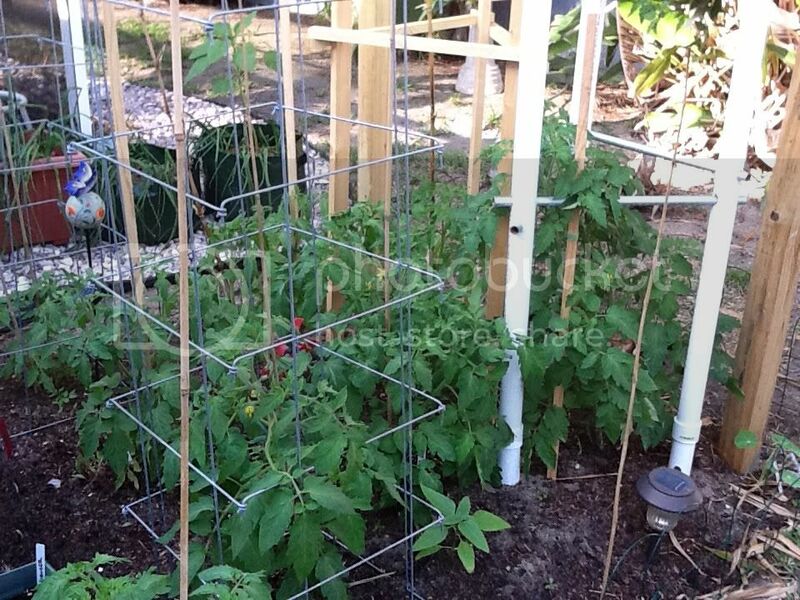 I did get growth, good vines, and then ultimately a few tomatoes. Then, alas, I had some problems with tree sap (or aphid honeydew, now sure which). What I will do this year is put in a second planting in late early September. Planted Lettuce, Broccoli, Cabbage, Brussel Sprouts today with my 3yo daughter. potatoes, carrots, and Spinach should be in by the end of the week. WOW! I finally got a break. 60Ã‚Â° today and breezy. Warmest day yet. The breeze dried the ground out enough that I could get on it. Planted some spinach, garlic, onions, peas and lettuce. I will likely wait until April to plant more. It is still early for this country. I had planted garlic in the fall, but had some that was sprouting, so it may as well grow. It will make something. The onions I planted were Egyptian onion bulbils. They will make some early green onions. I have a notebook I keep records in and make notes. I always check supermarket prices during harvest season and record them. Looking through those price lists just now and was reminded why I grow a garden. jal_ut wrote: WOW! I finally got a break. 60Ã‚Â° today and breezy. Warmest day yet. The breeze dried the ground out enough that I could get on it. Planted some spinach, garlic, onions, peas and lettuce. I will likely wait until April to plant more. It is still early for this country. Seems we are a month early in this part of the country as well. I have always waited until Easter to plant my early stuff. I planted today knowing full well a Blizzard could happen (no matter how unlikely) before March is over. 10 day forecast is over 70's for highs; lows in the 50's with no sign of letting up. This is late May, Early June temps. The prices at the Grocery Store is Outrageous. $2/lb for apples, $3.50/lb for ground beef. I don't even look at veggies in the fresh produce and buy frozen if I need them. Half a cart full of healthy stuff is over $150 these days. I am thankful for having a garden and Angus cattle for beef. Last year our garden didn't do much and we felt it. I really need it to work this year. Grocery prices are not going to get any better anytime soon. Well im glad alot of you are able to get some stuff in the ground abit earlier than usual. My onions, lettuce,radish, and peas are doing well along the strawberries. Built a raised bed yesterday and am in the process of filling it in with dirt, along with finishing my fence for the hungry deer. Did plant a couple rows of beans today...taking the chance. Although the weather looks to be fine for the next ten days.